It was inside-the-box thinking that led a team of architects and eye specialists to reimagine a shipping container as an ophthalmology clinic. The new facility, located in a 20-by-8-foot customized shipping container, is the product of collaboration between the University Health Service (UHS) and faculty members at the W.K. Kellogg Eye Center and U-M Taubman College of Architecture and Urban Planning. 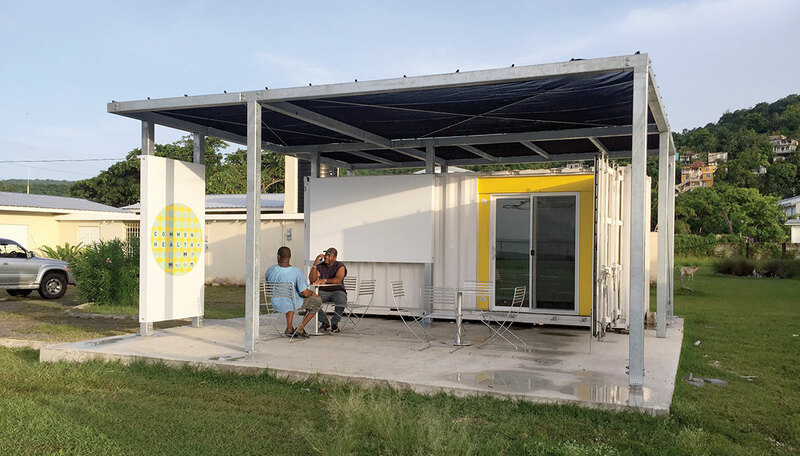 Their goal was a uniquely self-contained clinic environment — something that could be outfitted in the United States, shipped and unpacked with minimal setup as a functional health center anywhere in the world. In this case, the container landed in Sandy Bay, a small beachside community on Jamaica’s northwest shore. “Early trips showed us just how great the area’s needs were,” says Joseph Myers, O.D., an optometrist at UHS. He said it is estimated that 80 percent of the population has never had an eye exam. Since co-founding the Eye Health Institute on the island in 2001, Myers’ mission to improve access to eye care led to a relationship with the Kellogg Eye Center. Kellogg sent a team of eye care providers and low-vision specialists to the area last year. “No matter how many exams we performed or pairs of glasses we made, we could help only a fraction of the hundreds who lined up for our services,” Myers says. The challenge was shared with Geoffrey Thün, associate dean for research and creative practice at the Taubman College of Architecture and Urban Planning. The container clinic is part of a larger Third Century Initiative grant project under David Burke, Ph.D., professor and interim chair of human genetics, who is developing easy-to-use technology to help patients in underserved regions monitor chronic conditions without having to travel to a doctor. The long-term vision of Burke’s Deep Monitoring project calls for fully automated technology that patients with chronic conditions can use independent of a doctor or even a medical technician. His team has been exploring potential autonomous devices across several medical disciplines and areas of the world, including new eye imaging technology in Jamaica. That’s how he learned that Myers was planning to ship some new eyeglass-lens grinding equipment to a partner clinic on the island. Optometrists and opticians use the equipment inside to make eyeglasses for locals. Future iterations will house diagnostic machines, including a high-resolution retinal imaging system to monitor diabetic retinopathy. Meanwhile, the clinic affords Kellogg a unique platform to teach, learn, train local residents and conduct research, say ophthalmologists Maria Woodward, M.D., M.S., and Paula Anne Newman-Casey (M.D. 2007, Residency 2011, Fellowship 2013), who are collaborators on Deep Monitoring.